Today’s post is brought to you by Nicholas Jones – Managing Director at IOTA Australia. IOTA are a major sponsor of our ‘Autumn Garden Revival’ and provide top of the range garden pots and planters. Did you know that you can plant most types of bamboos in pots and planters? Using garden pots, you can avoid many of the pitfalls that have given bamboo a bad name over the last couple of decades. Bamboo is the fastest growing plant known to man (though bamboo is classified as grass). It is also the most versatile and the most sustainable source of wood. Bamboo groves covers 14 million hectares of land on the planet, most of which can be found in Asia. In many Asian countries, bamboo groves are regarded to have the power to restore calmness and stimulate creativity. It is not merely a beautiful garden feature. Bamboo has been linked with spiritual renewal. Aside from its ornamental value in a garden, bamboo is also a source of food. Dishes made of bamboo shoots are quite common throughout the world. Bamboo can fit in just about any design theme. Running bamboo is a plant with a bad reputation among Australians and is regarded as an environmental weed, however when using planters these problems aren’t really and issue. Clumping bamboo can be grown without fear of escaping and makes for a stunning feature in any design. They can be used to hide a fence or even create a fence or boundary. Clumping bamboos come from tropical rainforest and they are non-invasive in nature. Each rhizome (the woody underground section) only produces a single vertical shoot, which is known as a culm. These are positioned very closely to the parent plant which actually limits the plants growth area. This also makes the growth pattern predictable. For clumping bamboos, all shoots grow upwards during spring and summer. Maximum height of each shoot can be achieved on 60 to 120 days depending on the plant variety. Some varieties of bamboo have been even known to grow by as much as 1 meter in a single day. 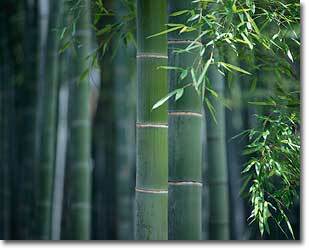 This is possible because clumping bamboo focuses its growth above ground unlike running bamboo which focuses growth below the ground. Two of my favorites are Bambusa guansxiensis ‘Chinese Dwarf’ and Himalayacalamus porcatus ‘Nepalese Blue’. The Nepalese Blue grows long and slender branches that sway in the wind and add some real height to the design and looks great in a series of multiple plantings. While The Chinese Dwarf can be a feature all on it’s own. Both of these are readily available at any garden centre. Clumping bamboos will reach their maximum height within four to five years while running bamboo usually takes up to 10 years. Running bamboo is very intrusive. In fact, many people have sued their neighbours for intrusion because of bamboo. Because of this it is not as readily available commercially, but if you do find some and have your heart set on it, just make sure to take the necessary precautions. Running bamboo spreads quickly. So, if you plan on planting this kind of bamboo you should prepare an underground impervious barrier at least 1.2 meters deep. Make sure that this barrier is permanent and lasting. Remember that concrete can crack and galvanized iron will at some point develop rust and break down. Or you can use plant containers, only the better quality ones will stand up the vigorous root system of running bamboo, so make sure your planter come with a 5-Year Guarantee.